So you are thinking about modernizing your intranet and would like to estimate your return on investment for this project. Most software vendors and consulting firms focus on justifying the financial benefits of their solutions. On the investment (costs) side, vendors usually include only their own budget in their ROI calculations: the license and three year maintenance, some services for the project, some training, and voilà. The reality is, however, that an intranet project also mobilizes internal workforce and sometimes external services outside the software vendor scope. The unfortunate reality is also that an intranet project with a license, maintenance, and training does not necessarily equate to a successful and adopted intranet, which is what you want if you want to reap full financial and business benefits. 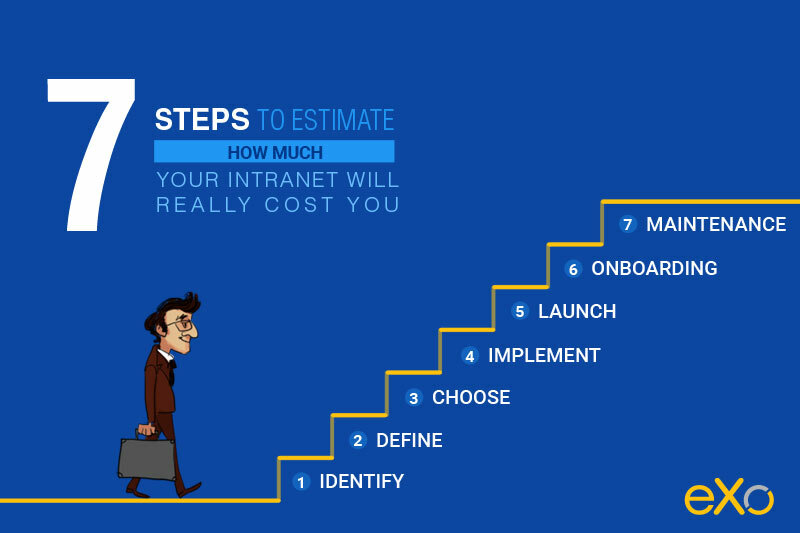 So how much will your (successful) intranet REALLY cost you? Of course, it all very much depends on your internal situation and needs. In my steps below, I will try to cover some common situations for a medium-size company (500 to 3,000 people). If your company is smaller, you can stick to part one. If your company is bigger, the principles covered here can be used at your subsite or business unit scale. Let’s summarize the key steps that you will need to go through in order to get your intranet up and running. Step 1: Identify your champion, usually a team. As a senior executive, you’ll first need to create a team that will own the intranet project. The latter usually includes a business consultant (external or internal) and a technical representative (usually internal). Of course, finding the right people for the job is important and may take time, but we will neglect the cost associated with this step. Step 2: Define your requirements. Your team will start by expressing the needs of your business users on the one hand, and the technical requirements and constraints of your IT set-up, on the other hand. In order to do that, the business/functional consultant will analyze the company’s human resources demographics in order to map the important user groups (age, role etc). He or she will then interview a number of users and launch user surveys, compiling a list of reasons why the current set-up does not satisfy users and a wish list of what features they would like to have. He or she will analyze the obtained information, prioritize it, and express it in features and solutions vocabulary. The technical consultant will, meanwhile, list constraints linked to internal IT systems and legacy—type of servers, databases, cost types, etc. As a result of this work, the team will produce a document listing project requirements and constraints. If all goes well, this phase will last about three months and occupy the two consultants 50 percent of the time. Assuming that a consultant works at an average annual cost of 60k, this part of the project adds up to a total cost of 15k. Step 3: Choose a solution. During this phase, the team sizes up the project budget based on an RFI or its market knowledge and puts together an RFP based on the findings from step 2. The usual selection process takes place—treatment of proposals, shortlist of vendors, presentations, demonstrations, user testings, etc. Ideally, you quickly find a vendor whose solution corresponds to all of your requirements, who is compliant with your IT constraints, and whose offer is in line with your budget. This phase concludes with term discussions and contractualization of the relationship. Typically, this step lasts from four to six months and also requires a commitment of 50 percent of their time from your two project managers, at a total cost of 20–30k. Other people’s input may be required during this evaluation process, but we will set the cost of their time aside for the moment. Step 4: Implement your intranet project. Once your intranet project is drafted on paper, the vendor provides resources that have been agreed upon: typically an architect to ensure integration to your company IT infrastructure (enterprise directory, etc. ), and some developers to customize the home page and add features or functionalities if required. Designers must usually be hired separately to customize the intranet’s visual identity. The vendor puts the solution in production and provides some admin and technical training to the teams responsible for maintaining the project internally. To estimate the cost associated with this stage, you should first note the vendor costs for licenses, subscriptions, and services. Typically, a simple deployment for our original target company size without deep integration would cost around 50k. Annual subscriptions would cost around 30k. Internally, your team will again work half time, at least on this project, for its duration, for a minimum of four to six months. That will cost another 20–30k. Until now, the project has lasted a year and cost you around 100k in one shot expenses, between vendor fees and internal costs. This excludes license and subscription fees that could be recurring, depending on the mode you choose. In a way, this is when your project really gets started. Step 5: Launch your intranet. Once your intranet is ready to go, you need to roll it out to your users. Whether you do so gradually or at once, there will be a communication campaign around the project to build up anticipation and excitement and to facilitate adoption. Depending on the scale of the campaign, you may or may not be able to neglect this cost. Step 6: On-board your users. Now that your intranet is up and running, you need to ensure adoption. An intranet that nobody uses brings no benefits, so it is critical to plan for your change management and onboarding ahead of time. The user on-boarding phase lasts several years and requires user trainings and follow-ups, as well as some animation and community management. Of course, the first year is critical to get on the right track—in the first year, you will need to invest as much in change management as you did in the technical project. Let us say 50k plus a half-time project manager (30k). Step 7: Maintain your intranet. Once your intranet is in production, it will cost you something to maintain it technically, provide support, and animate it. Even though these costs are outside the scope of investment and ROI calculation, you should still estimate them, especially if additional investments are needed. In all, your estimated total investment adds up to 275k for three years. What can go wrong and end up costing more? All the steps could last longer and thus cost more. I mean, they could last MUCH longer and cost MUCH more. Sometimes the requirement expression phase continues on and off for more than a year, for example. You may not find a vendor that perfectly suits all your feature requests, IT constraints, and budget. A missing feature might be developed that requires a budget. A very complete solution, feature-wise, can become a nightmare to integrate to your IT set-up, which will also require additional money in your budget. Prepare to compromise, because you most certainly will have to. It is possible that you might not be able to produce a compelling project without more complex integrations to your business systems. For example, if you are an insurance company and 50 percent of your staff uses an actuarial calculation tool daily, you will need to integrate that tool into your intranet or fail to convince 50 percent of the workforce. Finally, depending on your organization maturity, management style, and demographic profile, it might cost you much more than you expect to drive adoption. Modernizing your intranet is a lot of work and a lot of money, that is, if you want your project to be truly successful. The good news is that a successful intranet will more than compensate for this investment.